The Muslims have no Sabbath – they go to the mosque on Friday but are not prohibited from working on that day. Note also that the penalty of “death” is one of the spirit more than the death of the body. The language is hyperbolic. But why is observance of the Sabbath given such a high priority? There are certain commandments that are spoken of in life or death language. DC: Setting aside some time each week to contemplate, to consider deep questions, is necessary for survival and progress. RL: There is a link to the creation story of God resting on the 7th day. PG: His conduct is a model for human behavior. This is a primer for moving people from faithlessness to faith. Although there is no instruction to attend Temple – one was expected to pray three times a day. The synagogue didn’t really come into existence in anything like its modern form until the 8th or 9th C. Islam comes into existence at a time when Judaism and Christianity were in existence and accordingly many of the tenets and practices of those faiths were adopted. Instead of praying three times a day the founders of Islam elected to pray five times a day. The idea must have been that this repetition and practice would make the congregant even more attentive to his/her faith. 35:4 Gifts for the Eternal. All very upscale or necessary for the operation of the Temple and the adornment of the priests…. From every person who’s heart is so moved. Moses is “saying” to Israel rather than “commanding.” This is not a tax as was the half shekel previously imposed. 35:20 Offering are made by those who hearts have moved them. LinL: Where did they get all these riches? Was it the wealth they took from Egypt? PG: This was written much later than the escape from Egypt. It is suggested that this was written during the time of Solomon. The Tent of Meeting has been moved inside of Solomon’s Temple. Richard Friedman has written about this. See: http://www.jstor.org/discover/10.2307/1454824?uid=3739832&uid=2129&uid=2&uid=70&uid=4&uid=3739256&sid=21103436985291 LL: By this time it sounds like they were an affluent mercantile society living at the crossroads of trade in the Mediterranean. The Eternal Light. But here it says that it will burn only from evening to morning. The practical rationale is for dealing with the darkness. Pure olive oil puts out little smoke as compared to wood. When did the light become “eternal?” PG: Probably during the period of synagogues. 28:6 The ephod of gold. See Note 6. SF: This is a description of a tribal leader? PG: No. the description of the names suggests that many generations have passed since Sinai. The is no mention of separate tribes. They do not reappear until the beginning of the Book of Numbers with the census. The redactor seems to want to move the focus from the people standing at the base of Sinai to the tribes. This was the people Israel. But at some point the writers/redactors have to deal with the reality that confronted them. There was a hierarchy. But not in Exodus except for the creation of a priesthood. LL: Division is a necessary part of government: political parties, different and municipal structures. Consider the replication of this sequence described in The Promised Land with the resettlement of Israel by kibbutzim. PG: This happened as well when everyone left the Grand Concourse in the Bronx. RG: This is a critical juncture in the life of the people. It is necessary to get all of the rules in place even as they become more geographically dispersed over the land of Israel. PG: This was likely written at the time of the Second Temple – which was considerably less than Solomon’s Temple – not as grand a structure and doesn’t have the Ark. These sections are likely a description of what was rather than what existed at the time of writing. It is a memory that calls for a future recreation. (PJ: Why does the thread a mixture of cotton and wool? I thought that they were incompatible. PG: This is required of certain kind of clothing so as to make it unique. CL: We are living in a bubble of present day Jewish culture with its emphasis on words and philosophy. Ancient cultures were more frequently opulent and comfortable with that opulence. SF: But what was the significance of the Breastplate of Decision? What decisions were being made? PG: This was more in indicator of authority. The Book of Leviticus sets forth the responsibility of the priests – including determining what was holy and what was not. Note that there is no possibility of appeal from a determination by a priest on those issues. SF: The breastplate is near the heart so suggests something deeper – a breastplate within one’s heart – a pure heart effaces one’s ego. PG: This is demonstrated in modern times by Al Gore certifying George Bush as President. I believe that GB would have done the same if the roles were reversed. Most of us “buy in” to the necessity for the rule of law as part of the American model. The Golden Calf Incident. This aliah is not read as an honor. It is a negative experience in the history of the Jewish people. Both Christians and Muslims have taken advantage of this episode as an explanation of why Judaism fails and is not the way to redemption. It is an intentional misreading of Torah – which is intended in part to describe the difficulties of attaining faith. The concept of Israel is theologically daunting to some elements of those faiths. 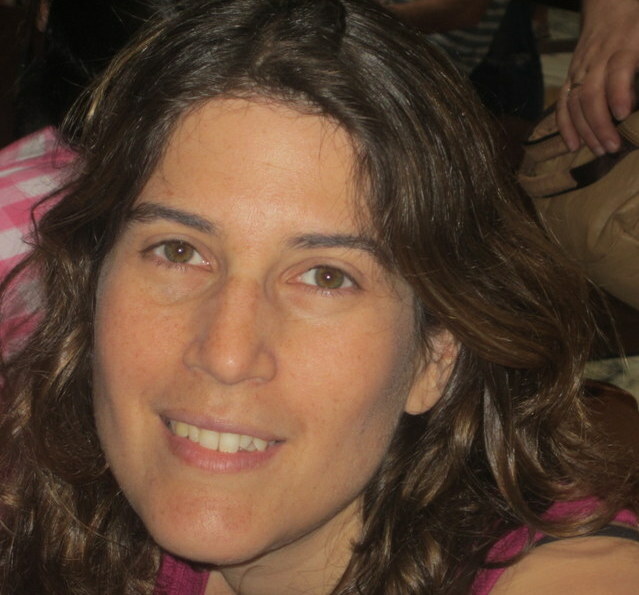 LL: It is also difficult for some Jews. See the NY Times today wherein a number of religious Jews in academia voice their opposition to the notion of a Jewish State. 30:17 A description of what must be paid – the same amount for rich and poor alike. It is a small amount that the poor can actually pay. Note that the taking of a census is in itself a sin – but a necessary evil. It is likely associated with the cost of building the mishkan as described in the last two sections. When it comes to counting individuals it is important that each person is “worth” the same. Note also that the Tent of Meeting is the Tabernacle – not a separate place. But what is wrong with doing a count? It is necessary in order to have minion for a service after all. And even agrarian commerce requires counting. 30:17 Aaron and his sons get to wash before entering the mishkan. This is clearly a purification ceremony but also designates the Aaronites as having special favor. Also, water is a critical component of life in these arid areas. see p. 544. 30:22 Making the anointing oil. Again the sons of Aaron are giving precedence. Note that Moses could not be a priest because he was the anointer of priests. As to his sons becoming priests this was a contentious issue which the Aaronites won. This is clearly a retrojection – including the reference to expertise in the bending of aromatic oils; an expertise not immediately associated with an agrarian society. Note the use of the Hebrew word “hochmah” which suggests an expertise as a gift from God. He starts with a text from ancient Mesopotamia which describes how something is built. It is the notion of divine intercession. But instructions, it is noted, will work without a prayer. LLant: What does the traditional hand motion mean that is associated with lighting the candles? PG: We are pushing away evil spirits – a practice from the Middle Ages. The mezuzah on the door is also activated by a prayer. 30:34 The ingredients to be used for the incense. Again, misuse results in being cut off from one’s kin. See the incense altar depicted on p. 544. Note that Jews should not refer to Israel as a “holy land” since one could not live there if it was “holy.” Here we are not given proportions for the creation of the incense. Lunchbox Reports – Over 100 Served! The VT Fifth Grade Sunday School class ran the Lunchbox program at the Family Partnership Center in the City of Poughkeepsie this past Sunday, February 2nd. Over 100 people, including some children, were fed through donations made by the Temple membership. Usually at the beginning of the month, the Lunchbox is not as busy, but this was not the case this week, and has not been the trend this past year. The Lunchbox itself was under-staffed this time, so our team was worked hard. It is more important than ever that our congregation continues to support and expands its contributions to this charity. 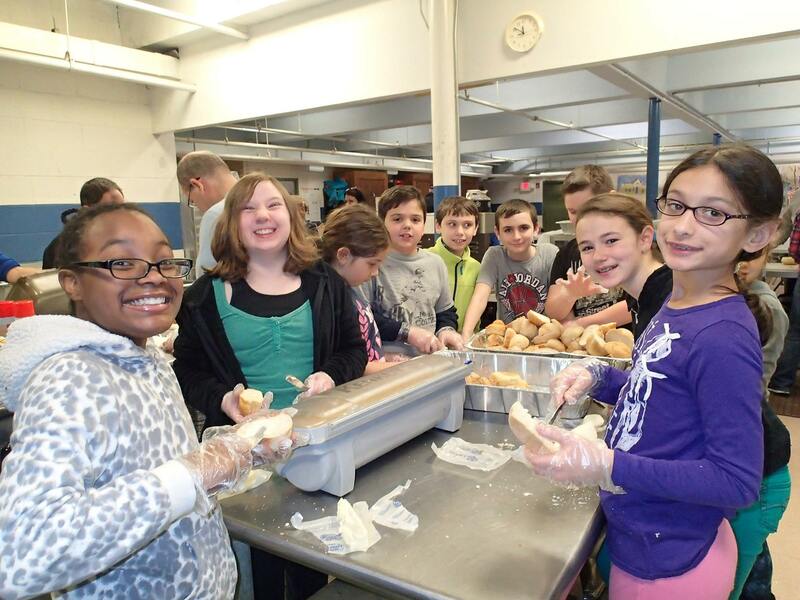 VT 5th Grade Class Cooking Up Meals for DC Needy. The VT team included Jack Barlow, Leah Barlow, Aidan Brown, Jeremy Frankel, Natalie Frankel, Gigi Goldfisher, Mariel Kelson, Sam Kelson, Rachel Krumholtz, Anna Metzger and Jordan Russo from the Fifth Grade, and parents Howie Brown, Carolynn Frankel, Julie Goldfisher, Marilyn, Joel Kelson, Pramila Krumholtz, Mark Metzger and Mark Russo. 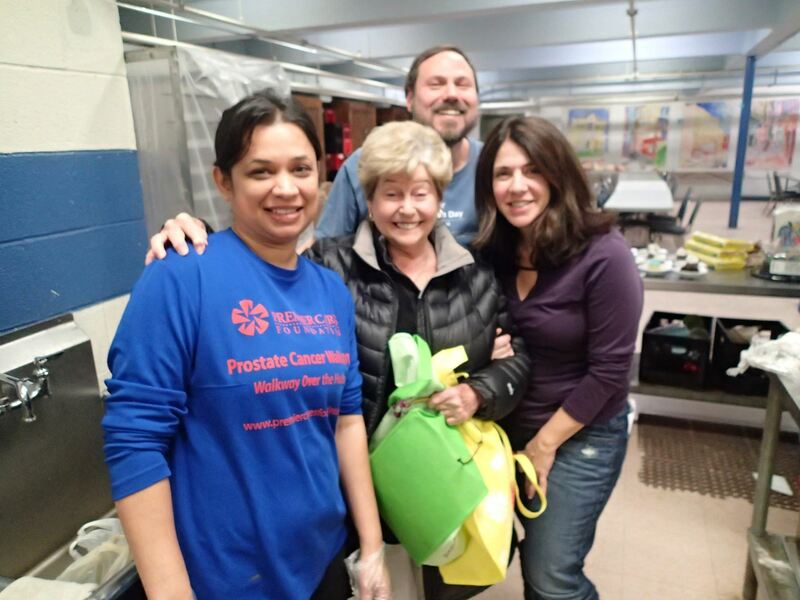 While Pramila, Marilyn, Mark Russo, and Howie were manning the ovens and making the main dish, Mark Metzger was making the sides and the salads, Julie ran the front line, and Joel and Carolynn were floating around helping whichever team needed us. The kids were doing the bread, mixing the salad, plating the desserts, pouring the drinks, opening cans and handling the service. When things really got going Howie and Mark Russo joined Julie and the kids up front while Pramila, Carolynn, Mark Metzger, Marilyn and Joel kept the kitchen running. Without Linda Babbas and Marian Schwarz, we could not do this. They are dedicated behind the scenes with their support, advice, shopping, reminders, recipes and class lists. This is a true team effort. 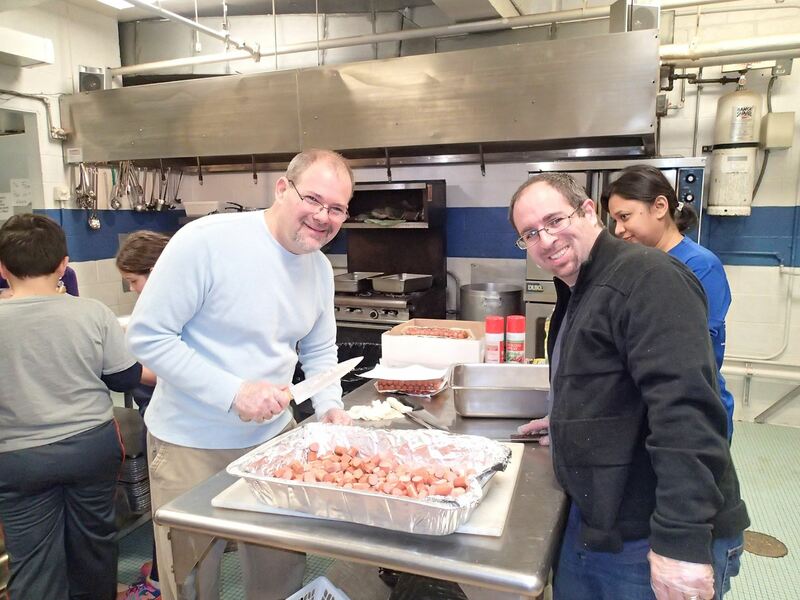 This Sunday morning Vassar Temple Sisterhood and Men’s Club teamed up in the kitchen for three good causes. With Passover around the corner we have to clean out the bread, so turning our challah into French toast was a perfect way. 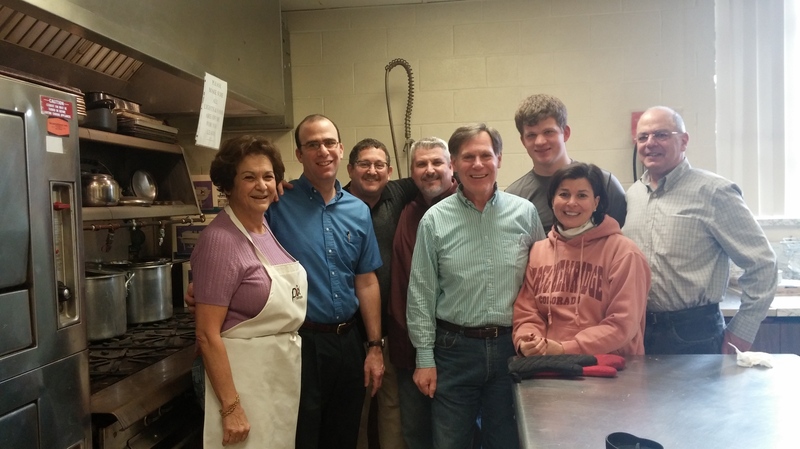 Making breakfast for the religious school children and teachers, as well as friends, was the second great cause. Last but NOT least, we used this occasion to raise money for the Lunchbox to feed the hungry. It was a success! It was also yummy and fun too! Thanks to all the participants, especially Perla who organized us and got us all home in time for SB pre-game. 28:10 Jacobs Ladder – there has been considerable discussion about the translation of the Hebrew word for ladder. Clearly a conveyance for going up and down. But there are two words – including one for “staircase.” Why a stone for a pillow? It takes on greater significance as the story moves forward. Note also the generality of the language as to place – it is indeterminate. Note also the comparison of the descendants to dust – rather than stars. There are radically different images. Dust has a negative connotation. SF: What did Jacob do to deserve this blessing from God? PG: But what did Abraham do? Jacob was chosen before he was born. 28:16 LL: Is Jacob referring to the place where he fell asleep – that he now sees with new eyes? Or has he been transported to God’s house and gates? What is the “this” being referred to? LL: I would prefer to think that he is seeing the beauty of the place where he is with new eyes. Or is the Gate of Heaven his dream? There is a great deal of ambiguity here which gives rise to much discussion and analysis. SF : We have a responsibility to bring God into our lives. Jacob assumed that God was back in Beersheba with his father. This teaches that God can be anywhere if the mind is open – in this case via a dream. Now God is everywhere where there is dust. DC: The “”this” – perhaps indicated by a gesture – could be the person. i.e. each of us carries God within us and our bodies are the Gates of Heaven. 28:19 Jacob negotiates and lays out preconditions for tithing to God. Jacob is the first biblical figure that we encounter from childhood and therefore have a back- story for. AF: Did Jacob previously act immorally in the birthright story? Is this a continuation of his tendency to be devious? PG: Superficial reaction does not give a clear understanding. The issues here are ones of justice. Is there an overlap between justice and ethics. Are they always the same? Remember that there was a conflict between Isaac and Rebekah as to who should properly receive the blessing and birthright. 29:1 Jacob meets Rachel. He rolls the stone covering the well on his own – showing off. He is now a physical person who has become more like his brother Esau. LL: This is all a radically different paradigm from other countries and peoples that had a fixed political location. History was not as important to them – only power and authority. As a result they frequently tried to destroy all traces and accounts of prior dynasties. This happened in China and at least twice in Egypt. It was a common phenomenon during the Roman Empire. 23:10 poles of acacia wood overlaid with gold. EL: Why was it so elaborate? Why the use of gold? CL: it would always shine and was very malleable. Acacia repels insects – very dense. PJ: Why would the poles remain in the rings all of the time? PG: Immediate portability. The writer may also be familiar with the story of Noah and his “ark” as compared to this one. But the Hebrew “aron” is actually a closet whereas in Noah it is a “tabeh” – a large floating object. SF: there is a paradox here: there is considerable work associated with portability and easier to have one central location. PG: Consider Mohammed’s instruction to pray toward Mecca – even though God is everywhere. This is an attempt to deal with this paradox of ubiquity and a single location. Note that Shomre’s ark is on the east side of the Temple whereas Beth El is on the west. East is traditional if one iis to pray toward Jerusalem. Vassar Temple’s is on the west wall. The alcove is a mosque faces exactly toward Mecca. Prayer rugs are usually designed with a similar niche. CL: This is reminiscent of the tomb of Tutankhamen which had figures in the corners and a winged figure on his pectoral. His sarcophagus also has the elements of face and wings – and that is considerably earlier. PG: There are likely antecedents that were used to indicate the presence of a deity – avatars of God – like the visitors of Abraham, or the figure that wrestles with Jacob. In Ezekial and Isaiah there is reference to “the heavenly host.” These are figures clearly independent of God – more than a manifestation. There is a tendency to fill in the chain of being between Man and God with other figures. SF: See: Rabbi Lozado and “the divine bureaucracy.” (LL: I could not find a reference to this on line) Note that the ark in a modern temple will never replicate the ark in Solomon’s Temple. This description is reserved for one place.